Pure technology enables water and wastewater utilities to “see” their buried infrastructure, and adopt a proactive pipeline management approach. Through more than 14,000 miles (22,530 kms) of pipeline condition assessment, we have found that the majority of pipe sections are still in good condition, leaving only a small percent of pipe sections requiring further investigation. By determining the true condition of pipelines, utilities can avoid the unnecessary full-scale replacement programs based on age, and focus resources on what their communities need most. While each project varies depending on the needs of the system, there are a series of steps taken to perform a successful condition assessment. Together, we determine what we want to achieve, ie. preventing catastrophic failures or service disruptions. Developing an inventory of assets to be assessed is an essential step in the process. This allows us to identify gaps in data early on. We use a number of proprietary sensor technology platforms based on pipeline operational conditions. These sensor technologies provide a range of integrity information to quantify true pipeline condition with precision. This allows us to make informed decisions and gather data. Our world-class analysis team transforms inspection data into actionable information about actual pipeline condition. This helps make scientifically defensible decisions for pipeline renewal. The results of the condition assessment and data analysis allow us to make informed decisions about how to manage utility systems. From small repairs to full system upgrades, decision making is rooted in data. The U.S. Environmental Protection Agency estimates that 70–90 percent of replaced pipe has remaining useful life. Identifying the actual condition of metallic pipelines through inspection is the only reliable method of making rehabilitation decisions. Pure Technologies is the industry leader in concrete pressure pipe (CPP) management, developing and implementing some of the largest pipeline management programs in North America. Many different methods and technologies can be combined to provide data and information to make decisions and prioritize pipelines. The Town of Flower Mound, Texas (Town), worked closely with Pure Technologies to conduct a leak and gas pocket detection survey of approximately 1.91 miles of potable water mains, which included nearly 1.4 miles of metallic pipelines. The Town is home to 70,000 residents and manages both the water and sewer utilities within Flower Mound. The Moulton Niguel Water District (MNWD) provides water, recycled water and wastewater service to 170,000 people within Orange County, California. In 2015 MNWD contracted Pure Technologies to perform a condition assessment of a large diameter steel pipeline running through residential areas and busy transportation corridors. In North America, the material and size of pipes that make up water and sewer networks range widely. 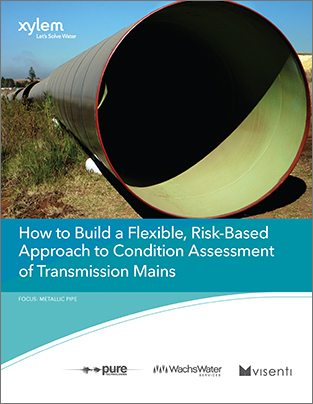 Because these pipeline systems are so complex, it requires a strategic approach based on risk and data for effective long-term management. Historically, however, it has been challenging to gather real data that can shape capital decisions for an entire system.